Yagyu Village (柳生の里) is located east side of Nara Prefecture. It is the home land of Yagyu clan and Yagyu Shinkage Ryu. There are many buildings and spots which are related with Yagyu clan, including their graves, the school, and ruins of houses. At Hotokuzenji Temple, there is a museum which exhibits many swords, armers, certificate and other items of Yagyu Shinkage Ryu. Especially, the sword record of Yagyu Jubei is a excellent book for all Yagyu fans. There is parking which you can get a map of Yagyu. Yagyū no sato or Yagyu village is in the city of Nara, Nara Prefecture. The area was the former territory of the Yagyu clan, who became famous as the sword instructors to the Tokugawa Shogun with their famous school of Yagyū Shinkage ryū. within the village are the former houses and the sword school of the Yagyū family. Yagyū Sekishūsai Taira-no-Munetoshi had studied the Shinkage ryu under Kamiizumi Ise no kami Hidetsuna and was granted in 1571 the certificate of "one person, one province", a licence to teach. He called his version the Yagyū Shinkage ryu to distinguish it from what he had been taught. In 1564, Kamiizumi Ise no kami Hidetsuna was travelling to Kyoto. While resting along the way in Ise, Hidetsuna asked the governor of Ise if he knew of any capable samurai in the area who might be interested in a friendly match. The governor recommended Munetoshi and a friend of Munetoshi Kakuznbo In'ei a monk and expert spearsman of the nearby Hōzōin temple. Hidetsuna sent a messenger to the Hōzōin temple to ask the two men if they would be interested. Munetoshi agreed and they met at Hōzōin temple. Munetoshi was soundly defeated and following the custom of the time he became Hidetsuna’s disciple. 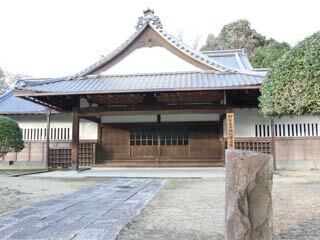 Munetoshi invited Hidetsuna to his home in Yagyū village where Hidetsuna taught Munetoshi Shinkage ryu for one year. Hidetsuna then continued on his trip to Kyoto giving giving Munetoshi an assignment to carry out while he was in Kyoto. Hidestuna asked Munetoshi to research the concept of Mutō-dori the methods of defeating an armed opponent while unarmed. While Hidetsuna was in Kyōto Munetoshi researched these methods and when Hidetsuna returned he successfully demonstrated them for Hidetsuna. Hidetsuna was impressed by these methods and immediately granted Munetoshi the certificate of "one person, one province," signifying the highest attainment in the Shinkage-ryū and permission to teach it. Munetoshi taught the Shinkage-ryū to his sons and other men. The certificates given out by Muntoshi that date back to 1580 still survive today. In 1589 Muntetoshi wrote the Yagyū Kaken a memoir and treatise on proper conduct meant for descendants of the Yagyu clan. In 1593 Munetoshi became a Bodisattva Buddhist monk, taking the Buddhist name “Sekishūsai Songon”. In that same year he wrote his famous Heihō Hyakka “One-hundred Songs of Strategy,” a treatise detailing methods of martial strategy. In 1594 Munetoshi’s prowess in Shinkage-ryū came to be known by a general of Toyotomi Hideyoshi; Tokugawa Ieyasu. Ieyasu was very interested in the military arts. He arranged for a meeting with Munetoshi to see for himself the methods of the Shinkage-ryū. Munetoshi brought his fifth son Munenori along with him for the demonstration. Munetoshi had expected only to give Ieyasu a demonstration using his son as an opponent and explaining the kata of the school, however, Ieyasu wished to actually try out the methods for himself. Ieyasu picked up a wooden sword and requested that Munetoshi demonstrate his Mutō-dori. As the story of the school says, Munetoshi disarmed Ieyasu three times sending Ieyasu sailing onto his back. Ieyasu was impressed and asked Munetoshi to teach him his Shinkage-ryū. Munetoshi however refused, claiming that he was too old and intended to retire from teaching In his place Munetoshi recommended his son Munenori(1571-1647). Ieyasu agreed to this and signed a blood oath to learn Shinkage-ryū diligently and to treat the Yagyū clan with favour. Munenori joined Ieyasu and was given the highest rank of hatamoto or body guard to Tokugawa Ieyasu. Munenori continued as a teacher also to Tokugawa Hidetada and Tokugawa Iemitsu, increasing the family income and prestige and establishing the Yagyū as hereditary swordsmanship instructors to the Shõgun. In that same year, a census of the Yamato province revealed hidden, non-taxed rice fields in Yagyū village. Munetoshi’s lands were taken away by Toyotomi Hideyoshi. Munetoshi therefore continued to teach Shinkage ryū. In 1600 Tokugawa Ieyasu moved against Ishida Mitsunari after the death of Toyotomi Hideyoshi. He dispatched Munenori back to Yagyū Village, to ask Munetoshi to raise forces in the Yamato region. Munetoshi was 71 and too old to lead the forces himself so Munenori led the Yagyū forces. They marched to Ieyasu's position arriving a day before the battle. Ieyasu soundly defeated Mitsunari with the help of the Yagyū forces, and among the rewards given to the Yagyū was the return of their ancestral lands which had been taken from them earlier by Toyotomi Hideyoshi. In 1604, Munetoshi’s grandson, Toshitoshi, left Yagyū village to serve the great general Kato Kiyomasa. Toshitoshi was in Kiyomasa’s service only a year before jealousy from the older retainers forced him to leave. Toshitoshi used the opportunity to travel about testing himself against and learning from different teachers. In 1606, Munetoshi urgently summoned Toshitoshi back to Yagyū village. When Toshitoshi returned Munetoshi, now in ill health, bequeathed to his grandson all of his Shinkage ryū materials, including the license of transmission and scrolls he had received from Hidetsuna. In 1606, Yagyū Sekishūsai Taira-no-Munetoshi died at age 78 in Yagyū village. After Munetoshi's death his son Munenori took possession of the family lands in Yagyū village, and built the Hõtokuji temple in Munetoshi’s honour. Munenori’s son Retsudō was assigned to be the head abbot. The temple is still there today in Yagyū village on the grounds where Munetoshi’s house once stood. With the patronage of the Tokugawa family the Yagyū family future was secure and enjoyed prosperity until the end of the Tokugawa era. Munenori, initially only a hatamoto and sword instructor to the forces of the Tokugawa, became a trusted aide to the third Tokugawa Shōgun Iemitsu. In 1629 Munenori became the Tokugawa governments inspector general a post which he held until 1636. His salary was raised to ten thousand koku (1 koku is 5.1 bushels of rice), the amount associated with the rank of Daimyo. In 1632 Munenori wrote his Heihõ kadensho the basic text of the Yagyū Shinkage ryū. The text is heavily influenced by the writings of the Zen monk Takuan who was a close friend of Munenori. Munenori's son Jūbei Mitsuyoshi contributed greatly to the school. He was not only a master of sword, but also a strategist, an expert of yawara (unarmed methods) and ninjutsu (spying and infiltration methods) which he had learned from the Iga samurai in the nearby area of Iga. He called his sword method chie no ken (sword of Transcendent Wisdom). The Yagyū Shinkage ryū was codified into it's current form by the fifth heir Yagyū Toshikane. He developed the basics and set them out in a document known as Sei hō. This document sets out the methods that were developed by Munenori.